The company has grown from the dreams of its founders to a company with design and manufacturing locations around the globe. 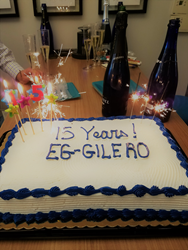 EG-GILERO has reached a milestone this October, celebrating 15 years of business. The company has grown from the dreams of its founders to a company with design and manufacturing locations around the globe. Co-founder, Ted Mosler, gathered associates for a toast to celebrate the occasion in the RTP, NC Design & Development Center. "We have achieved this milestone through the hard work and dedication of our associates and our customers. We have come a long way since the business was started in a garage way back in 2002 and we are very excited about our future as the company continues to thrive and grow," said Mosler when discussing this momentous occasion. Started as a design & development firm in the early years, EG-GILERO has grown to become a full-service provider to the medical device and drug delivery system markets. Over the past 15 years EG-GILERO’s in-house service offering has expanded from pure design & development to include tooling & injection molding, testing & verification, regulatory submissions, manufacturing & assembly and commercialization support. With operations in the United States, Dominican Republic, and Asia, EG-GILERO is strategically positioned to provide the value-added services our clients require in a competitive, ever-changing global marketplace.